The world of wearables continues to grow and improve as smartwatches get smarter, fitness trackers track even more and augmented and virtual reality headsets blur the lines between fantasy and real life even further. So what can we expect for 2019? Predictions suggest over 245 million wearables will be sold next year. Judging by the trends of 2018 there should be a continued push by companies to create the best possible smartwatch experience that crams more onto your wrist. That means more wearables that let you go out for a run without your phone but while keeping GPS and heart rate tracking along with music onboard. But expect deeper tracking too as ECG monitors become more prevalent. As smartphones become more powerful and Google keeps making software smarter, both virtual and augmented reality are due to get even more awesome headsets. The price should start to drop too. Here are some of the exciting wearable tech innovations we may see appear in 2019. The new Apple Watch 5 could be the ultimate wearable as the company continues to refine its smartwatch. But with the Apple Watch Series 4 already offering ECG and GPS, plus locally stored music already onboard, what more can be added? One of the most sought after features would be a longer battery life. While wireless charging makes keeping it topped up effortless, more juice can't hurt. That combined with a thinner form factor would be ideal, making it more comfortable for running and slipping under sleeves. Apple also needs to add deeper music streaming integration for offline music storage on the watch for Spotify, Tidal and more. Finally a game changer would be great, something like a blood sugar measure for people with diabetes. We can but hope. Expect the Apple Watch 5 to be launched by Apple around the usual September reveal time. The officially branded Google Pixel Watch didn't appear alongside the Pixel 3 in 2018 so we're pinning our hopes on a 2019 release with the Pixel 4. This could take the Wear OS to a new level with hardware integration offering a faster performance and more battery efficiency. This is thanks to a power management system rumored to be called Blackghost, which is able to offer longer battery life while listening out for voice commands without impacting on how much charge is left. This should offer a great way to use Google Assistant without draining smartphone battery life too. Other features we're hoping to see include an in-display fingerprint reader, rotating crown, swim-proofing, NFC payments, a three day battery and Garmin level fitness tracking. According to ever reliable Apple analyst Ming-Chi Kuo, we can expect Apple to launch a new pair of AirPods in 2019. These may come packing wireless charging, meaning they could be thrown down on a charging pad to get back up to full power without the need for any wires at all. This makes sense since the battery is small and charging times should be short. Apple AirPods 2 could also come with a newer version of Bluetooth for better connectivity and greater efficiency that may translate into better battery life. All this should mean that the addition of "hey Siri" integration works well for wider voice controls without needing to remove the phone from a pocket or bag. While these 2019 AirPods should be an improvement, the source says that 2020 will see a major redesign of the AirPods. But one step at a time, ey? 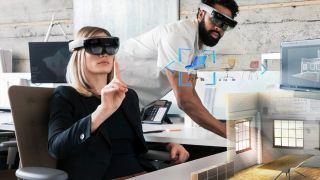 One of the major jumps forward in augmented reality hardware could be due to happen in 2019 thanks to Microsoft's new version of its HoloLens headset, which is rumored to have the codename Sydney. The headset is also rumored to be lighter and more comfortable than its two predecessors, and it may also be more affordable. All that and it should come with a significantly improved holographic display too. This version of the headset is finally expected to be one that's aimed at consumers. That should mean the price is lower, around the price of a flagship smartphone, so that's the £1,000 mark. The Magic Leap competition is expected to offer a similar product and price so expect 2019 to be the year augmented reality goes to a new level. The Garmin Fenix 5X Plus is one of the best GPS watches ever made as it combines super-accurate location and heart rate tracking with smart notifications, mapping, contactless payments and music storage. Plus it has really long battery life. How can Garmin top that with the Fenix 6 that's rumored for a 2019 reveal? The Fenix 6 is rumored to appear towards the back end of 2019. One way this could bring an improvement is to offer a smaller form factor. While the current Fenix options pack in lots of features, they're far too big and heavy to wear day to day, let alone for sleep tracking. Wireless charging would also be a nice addition to save digging out that proprietary cable. A high resolution touchscreen could also help make the Fenix 6 more smartwatch than simply GPS device. New sensors for glucose, blood pressure and sweat could all also appear to help make this even better than the Fenix 5X Plus. This sounds like a really cool idea and if they look good too, as Bose products generally do, this could be a really interesting way to stay connected without the need for a heavy, battery-robbing headset. Presumably they will also have microphones for voice integration allowing you to use a virtual assistant without the need to reach for a wearable or smartphone. These should get revealed at SXSW 2019. This kickstarted product is finally due to become a reality in January 2019. This takes the Star Trek universal translator dream and makes it a reality. This should be able to offer real-time conversation translation all from the in-ear system. That should mean as a person talks, you hear it in your native language so you can respond in your own tongue and, presuming they're wearing a headset too, they'll hear it back in their native tongue. If the WT2 works as well as it is claimed this could be the end to language barriers worldwide, at last. Will this be everything the Google Pixel Buds claimed to offer but fell short on? The company says that by launch time the translator will offer real-time translation via a smartphone with a decent internet connection. With 5G due in 2019 too this should help make for a genuinely useful translation device.